"The Guardian", Sarah Smarsh, Who Are the Trump Voters? What we need is to have our stories told. Dangerous Idiots: How the Liberal Media Failed Working-Class Americans. After she carefully watched us grand parent her sister’s three children for almost eight years, daughter Elizabeth decided she could leave her almost eight month old Samantha with us over night (28 hours and 34 minutes as it turned out). 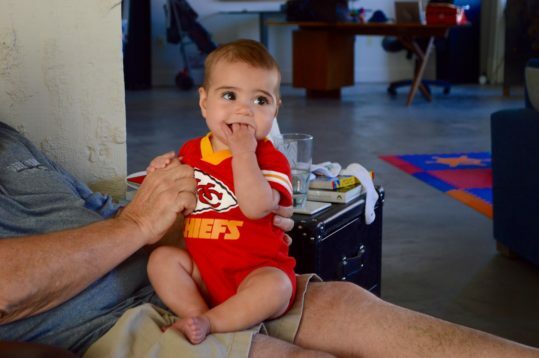 She was scheduled to run in a half marathon a couple of states away, and her husband, son-in-law Brandt, was scheduled to be away in California during that time for his work (with the Kansas City Chiefs). Thus, we found ourselves in KC this past Friday, reviewing Samantha’s schedule and receiving instructions from both Elizabeth and Brandt as to what we could expect and what they expected us to do. Actually, they both seemed remarkably calm for first time parents leaving the first born overnight. True, we had raised our own children with minimum of damage, but that was more than three decades ago. And, we had ‘taken care’ of Samantha for up to 12 hours, but never overnight. Still, compared to the “Miller Bible,” the 22 page outline we had drawn up for my sister 35 years ago when she was taking care of our daughters, Elizabeth and Brandt’s instructions seemed almost derelict. Other than a 12-step process to be followed for putting Samantha to bed at night and an outline of what and when we were to feed the child prodigy, it only took about an hour of instruction (with shorthand note taking). NEW YORK – As I have traveled around the world in recent weeks, I am repeatedly asked two questions: Is it conceivable that Donald Trump could win the US presidency? And how did his candidacy get this far in the first place? I voted today (absentee ballot) for Hillary Clinton for President. 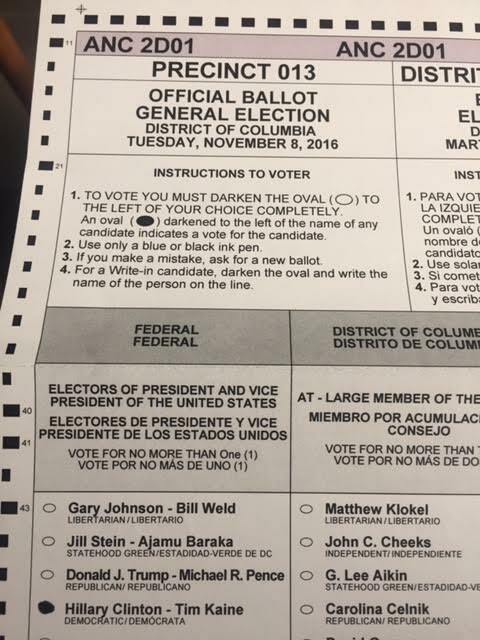 As I wrote in an earlier post about the DC Primary, this choice was an easy one to make. She is by far the most prepared, most serious, most competent, and most experienced of the two candidates. This vote is not simply a “lesser of two evils” choice. While I see and know her weaknesses and ethical challenges, putting this country’s future in her hands is the only rational choice to make. In voting for Clinton, I am also actively voting against Donald Trump. If you look at his supporters, he has clearly tapped into an unrest that pervades this country. He has correctly identified that the political establishment — Democrats and Republicans — have largely chosen to serve the interests of those who have access to power and influence in government and not to those who are struggling. However, Trump has also demonstrated, in so many ways, that he is both unprepared to be President and that he would be a dangerous choice. Without going into detail (no doubt the reader has his/her own list), it is clear that he has both traded upon and unleashed hatred, intolerance, and encouraged violence. We cannot afford to have a man with Trump’s temperament entrusted with the powers delegated to the leader of our country. Not voting or voting for one of the two third-party candidates is not an option as I believe that simply throws away a vote. See my earlier post on this point, There’s No Such Thing as a Protest Vote. For me, and for our country, Clinton is easily the best choice. And to back up my vote, I will go to Ohio from Nov. 4-8 to help with a Get Out the Vote campaign.